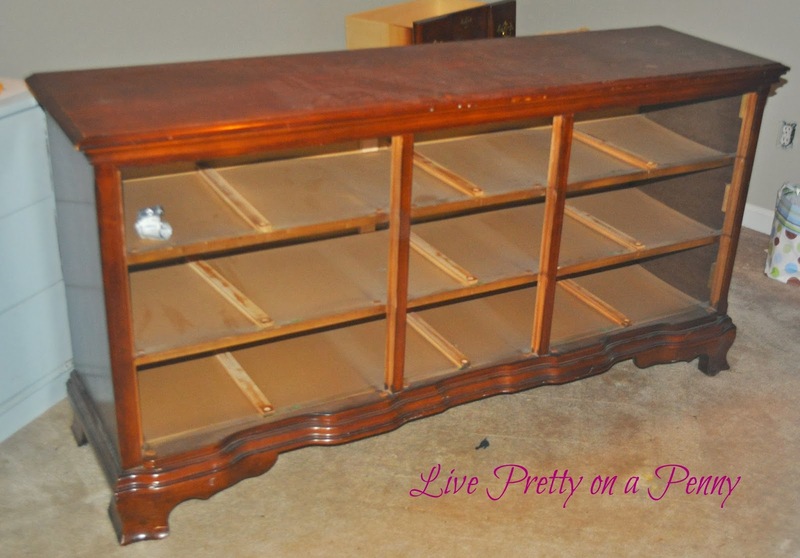 This is an old dresser that my husband used in his apartment prior to getting married. It had been living in the guest room and I have been requesting to strip and paint it since we moved into our home over two year ago. 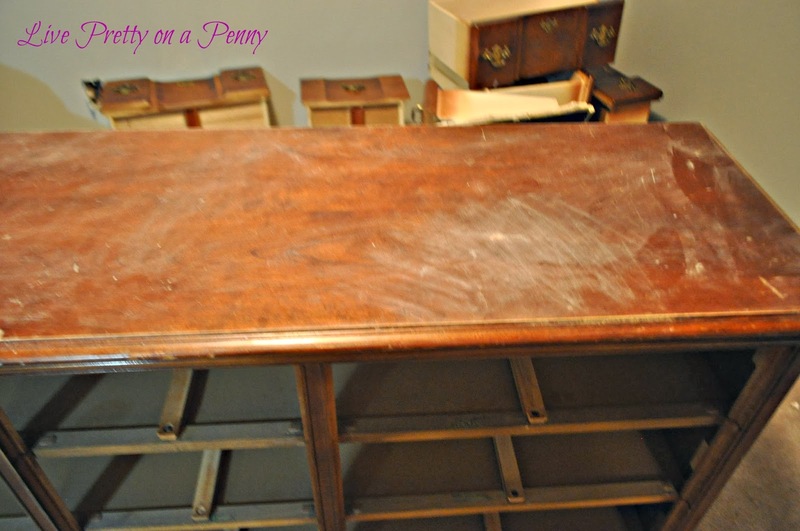 Of course the answer was “why mess up a good antique dresser?” My internal response was “it’s ugly and I hate it.” Anywho, once we found out we were expecting, we were determined to repurpose things around the house, as we could. Lucky for me, I talked him out of buying a new dresser and decided to just makeover the one we had. With a little work, you can achieve the same results. Here is how I did it…. First I removed all of the drawers, as you can see from the top picture. I unscrewed all of the hardware, propped the dressers on old cut 2×4’s, then I proceeded with a quick hand sand. When I say quick, it was quick! Nothing fancy, just enough to rough up the surface. This is done so that the primer/paint can actually adhere to the surface and won’t chip off during use. I could have applied two coats of primer and I probably would have been fine, but I applied three to be safe…allowing several hours of drytime in between each coat. After the final coat I let the dresser sit overnight. 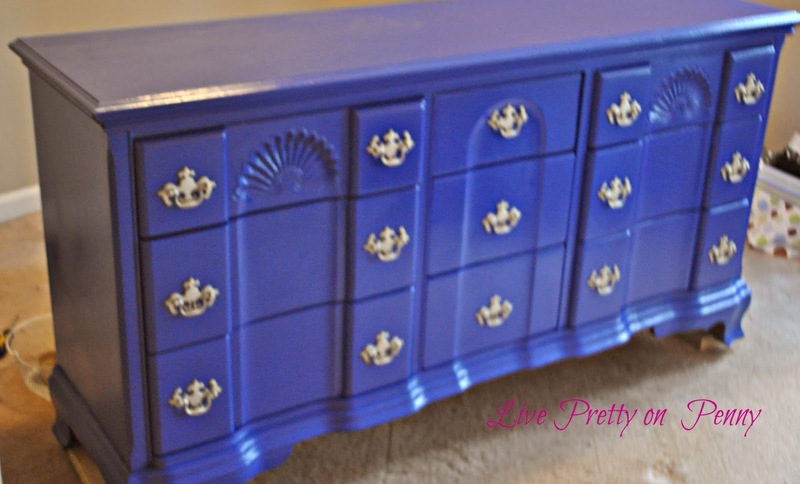 I knew that I wanted a rich blue color for the dresser, so I went with Behr Dark Cobalt Blue. I forgot what finish I used, but if I had to guess, it was probably satin. Definitely not flat, as I wanted something that I could easily wipe off. 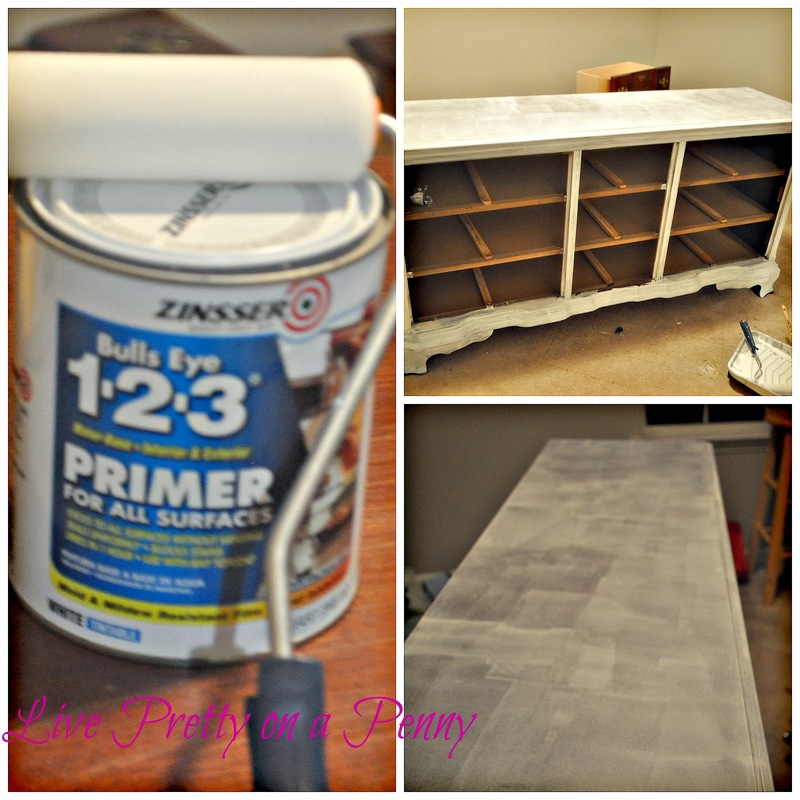 I painted the dresser using a small sponge roller, the same as the primer, letting the paint in between coats, for a total of three coats. I followed all of the steps for the drawers as well. In deciding on hardware, I knew that I did not was to close the original holes, because making new holes would be too hard and a bit too tedious for me. I went and checked out several retailers for new hardware, however because the dresser is so old, the spacing of the hardware holes no longer exist. I know! I couldn’t believe it. So I was forced into using the original hardware. I had some leftover spray paint in my garage from Hobby Lobby in a color called Pewter. I took a chance and spray painted the old hardware and it worked! I hope to soon be able to photograph his entire nursery. I am so in love with it! I love the new color, Erin! 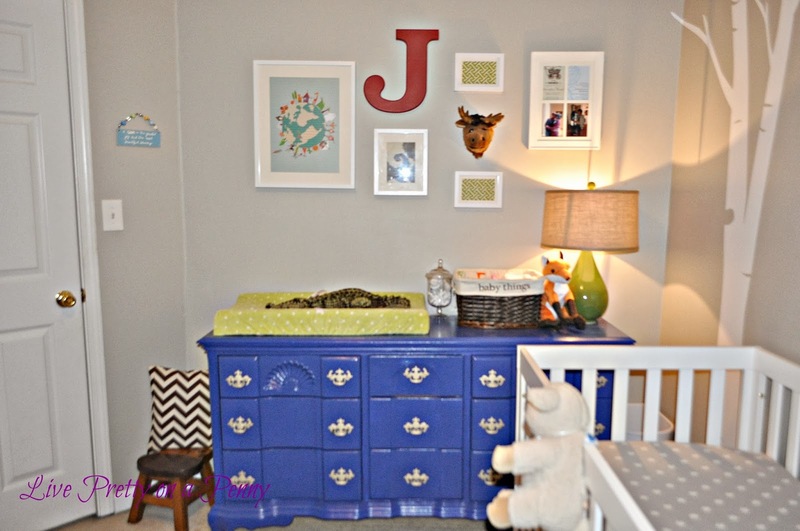 It's the perfect accent to the nursery! Can't wait to see more. The dresser turned out great and I love the color! Great color and transformation… it really is adorable! I'm with Brandi, can't wait to see more! Hi Erin. I'm glad I read your post. I've been thinking about buying a media center and painting it a different color. I thought I might be in over my head trying a project like that and changed my mind about it. You did such a great job with that dresser and you made it look so easy that now I'm reconsidering. I really love how your dresser turned out.